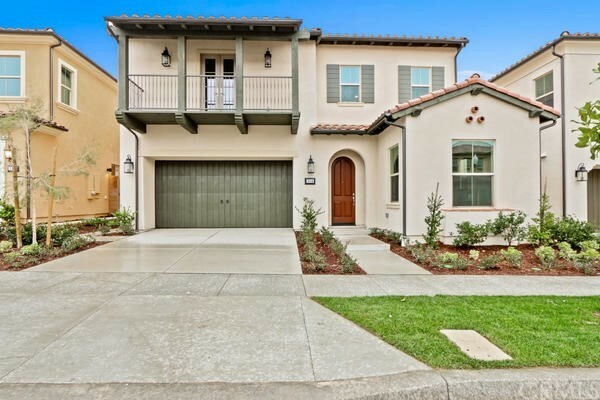 All Eastwood homes currently listed for sale in Irvine as of 04/21/2019 are shown below. You can change the search criteria at any time by pressing the 'Change Search' button below. "Brand new home in beautiful Eastwood Village welcome home to Avila! This beautiful Spencer floorplan features a Spanish-Monterey exterior elevation, covered porch entry and open concept great room, dining and kitchen area. The gourmet kitchen is fully-equipped with stainless steel, GE Monogram appliances, 36 cooktop with hood, maple cabinetry in white with soft close doors, natural stone countertops plus large walk in pantry and center island. The great room features beautiful bi-fold doors overlooking the backyard and covered patio for the perfect indoor/outdoor California living experience. The main floor also features a private bedroom and full bathroom. Upstairs, you ll find three additional bedrooms including a lavish master suite with private bath, dual vanities and walk in closet. A convenient laundry room and open loft area is also located on this floor. This home also includes upgraded lighting and flooring, 8 interior doors and new home energy efficiencies and warranty programs. Please visit and tour our beautiful model homes!" "Possible duplex in the making. Zoned R2. Bring your largest family to this Must See unique opportunity located in downtown Oxnard. Your lovely large 5 bedroom home features 4 bathrooms and lots of parking. The front yard features artificial turf and a the traditional white picket fence. The original part of the home has 3 bedrooms and 2 bathrooms with permitted expanded bedrooms. The permitted addition was built in the late 1990's and has 2 extra large bedrooms with 2 bathrooms with it's own separate entrance. The master bedroom features a soaking tub, plenty of closet space and the master bathroom. The 2nd bedroom features a large closet and a bathroom outside of it in the hallway. The back part of the house has it's own entry. You'll enjoy the private patio off of the driveway and big backyard with a security gate off the alley for easy access to the garage. The garage has plenty of room for 2 cars, and the driveway can easily fit 6 cars and the rear can fit another 4 more. The perfect set up for your largest family or use your imagination!"